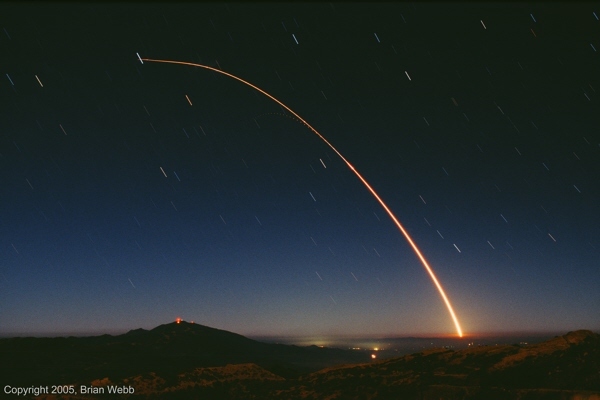 Early on the morning of 2005 August 25, a Minuteman III missile was launched from Vandenberg AFB on the California coast. 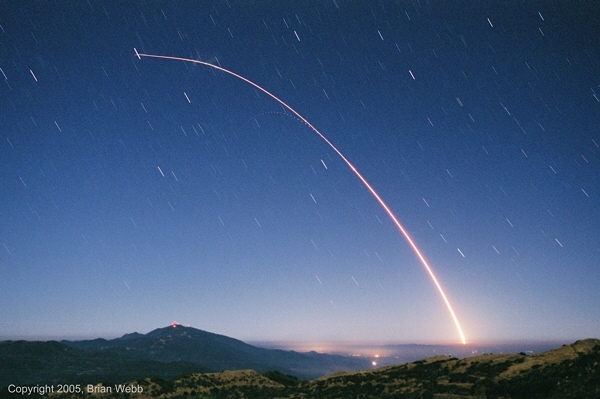 The launch sent one unarmed warhead on a 4,800-statute mile flight to Kwajalein in the central Pacific. The webmaster took the following photos of the event from the mountains north of Santa Barbara. These time exposures of the entire boost phase were taken with two cameras that used the same type of lens and were aimed at the same point. As an experiment, the cameras were loaded with different films. The above image was taken with ISO 400 color negative film. It was overexposed but shows substantial foreground detail. The same scene as above, but recorded on ISO 200 color slide film. This close-up of the color slide image clearly shows the curved line of dots caused by the flashing of the spent first stage. The first stage was still burning following stage 1/2 separation and easily visible to the naked eye. The bright section of the trail on the lower right was caused by a brief flare in brightness from staging. 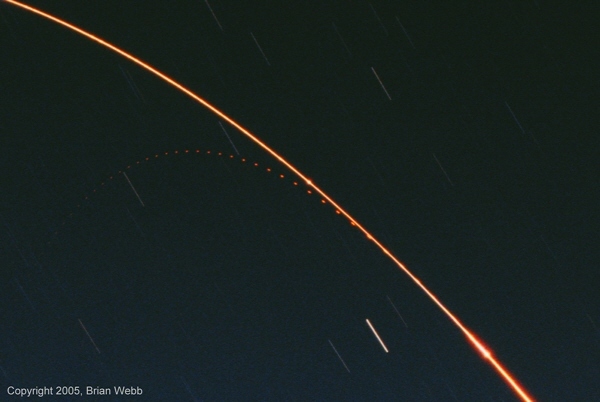 The tiny bead in the middle of the trail was possibly caused by a burning piece of material that the webmaster observed fall away from the missile during the second stage burn. Copyright © 2005-2006, Brian Webb. All rights reserved.